FIGURES gathered from a recent campaign show that there is a need to educate cyclists and motorists on road safety, police say. 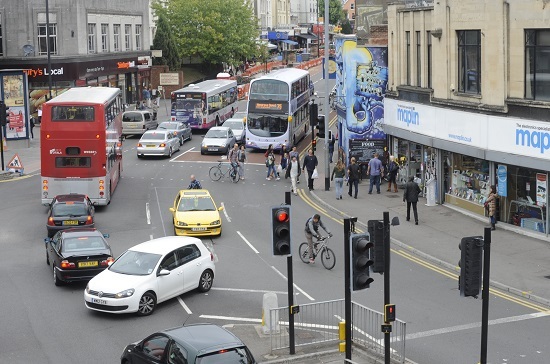 In the first two weeks, police carried out 18 hours of patrolling at key junctions on Gloucester Road and Whiteladies Road. Seven and a half of the hours were in evening darkness. A total of 348 motorists were cautioned for stopping in cycle boxes and junctions, while 160 cyclists were caught going through red traffic lights. Seventy four cyclists were stopped and advised for cycling on pavements and 17 motorists were stopped and advised for being inside the yellow hatch markings. Sergeant Sean Underwood, who is leading the operation, said: "The campaign has been going really well. The more people we speak to, the more we realise that there is a genuine lack of knowledge of the law in this area. "The fact that we have stopped and spoken to so many motorists for stopping in the cycle box just goes to show that people don't realise this is an offence." Educating cyclists on lights has also proved successful. Fifty out of 90 cyclists have been given 'conditional' tickets, whereby they are given the opportunity to swap a £50 fine for the chance to prove they have fitted lights on their bike. Twenty three have already been into the Bridewell station in the city centre and had their tickets cancelled. PC Underwood added: "We've started to work in partnership with the council's road safety trainers, who offer free cycle training courses for people to go out with bike trainers and improve their road sense. "We have also joined by the council's parking services team who will be out prosecuting drivers of vehicles who park illegally in cycle and bus lanes and on double yellow lines. "It's probably too early to tell whether drivers and cyclists are starting to the see the road through each other's eyes, but hopefully this ongoing campaign will improve relations between the two groups and make the roads safer for all of us."